OAKLAND, Calif. (AP) Warriors coach Steve Kerr didn’t see much passion from his team Saturday. 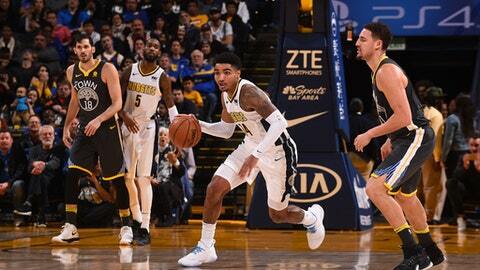 Gary Harris scored 19 points to lead a balanced Denver offense and the Nuggets stopped the Warriors’ 11-game winning streak with a second impressive road victory in two nights, beating Golden State 96-81. Patrick McCaw’s floater with 7:13 to go pulled Golden State to 82-71, but the Warriors couldn’t do much more to fight back. The Nuggets had lost five straight on Golden State’s home floor dating to a 100-99 win at Oracle on April 10, 2014. Stephen Curry did extensive on-court work during pregame warmups and appeared to be moving well on his sprained right ankle, though the two-time MVP isn’t going to play Monday. Warriors: Golden State’s 88 points in a 92-88 loss at Boston on Nov. 16 was its previous season low. … C Zaza Pachulia went through what he called a tough workout Saturday morning to test the soreness below his left shoulder and remained hopeful of playing Monday. ”We’ll see,” Pachulia said. ”I’m going to have another great workout tomorrow.” He missed his seventh consecutive game and eighth in nine. … Shaun Livingston sat out his fourth straight game with a sore right knee but got in a solid pregame workout and looked strong running. … Kerr stuck with his winning starting five from Friday after Golden State used eight different starting lineups over the previous nine games.